The film should work for two more reasons: the riveting story and the superior quality animation [a handful of scenes notwithstanding]. Besides, minute detailing has gone into the costumes, effects and the overall look. The one flaw that stands out is the lip sync of the characters with the voiceovers, which seems to go out of place in a few sequences. On the whole, with the only competitor being DHOOM-3, MAHABHARAT seems to be a good bet keeping in mind that it’s being released during the festive time of the year, coinciding with the vacations. What makes this version thoroughly enjoyable is the talent that has lent its voice to each of the prominent characters. And there’s a bonus too because the filmmakers have also tried to bring out a facial resemblance between the animated character and the actor who has dubbed for it. On the flip side, the animation effort itself is immature and several notches below those of Hollywood films. Yet the dub effort by the Bollywood superstars uplifts this epic, making it enjoyable. It must be acknowledged that it’s not easy to make animated films and – unlike live-action movies where magic maybe created in a moment on set – it requires toil and an imaginative force that must sustain for months and years. And in Mahabharat this endeavour shows, earning it an extra half star. But where are the new ideas? If only this was a made-for-radio special instead of a half-heartedly animated demo reel masquerading as a children’s fantasy. But dumbing down Mahabharat’s provocative and serious framework for a film that cannot even provide visual enchantment fails to fulfill it purpose even to its young audience. But this poorly put together exercise fails despite trying hard to recreate some of the most dramatic chapters from this tale. There is no attention paid to detail and most of the scenes look hurried and rushed. Also 3D doesn’t play an important part in making the film any more enjoyable. 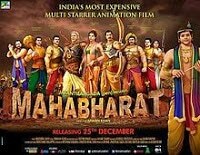 Despite the big names associated with Mahabharat 3D the film turns out to be a no show in its effort to entertain the audience. For a movie to hit the right buttons with the audience, it should first have an arresting subject, besides being delivered in style. Here, even though the subject is age-old, the delivery is drab. If only the makers had to pay that much extra attention to the animation and execution like they did with the characters and their faces, this epic would have been quite different and would have gone down well with the kids. Usually I would have given a thumbs up to indigenous works of filmmakers who are trying their hand at something new but with Mahabharat – 3D I was most disappointed. We have seen way better animation films come out of India and this one though undertakes the magnanimity of translating an epic, I will still suggest you to give this one a miss. It isn’t worth ending your year with a shabbily done films like it.